Are you experiencing the January Blues? Dubbed ‘Blue Monday’ by many, today marks the time of year we’re most fed up of the cold, the lack of sunlight and the fact it’s still more than a week until payday. That being said, days like this are fantastic opportunities to check-in and think of ways to boost the wellbeing of your team. After all, encouraging great physical and mental health isn’t something any company should forget to do, at any time of year. Here at UKFast, we’re using the January Blues and Blue Monday trends as yet another excuse to show a little love to the whole team throughout this week. Here’s how we beat the blues at UKFast Campus. Don’t let being hangry ruin your day before it’s even begun! 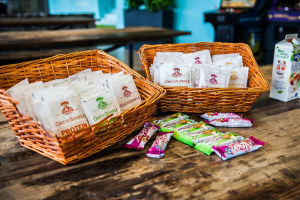 Every day of this UKFast Wellness Week we’re encouraging everyone around the business to get their fill of free porridge, fruit and breakfast bars. Staying energised is crucial to maintaining a productive team. We believe that there’s nothing like the rush of endorphins after a great team workout to brighten your day. Boxercise, kettlebells, HIIT and weight lifting workshops are all scheduled for this week’s lunchtime classes to help us smash through the January Blues. Not only is it a great way to stay healthy and burn off any excess Christmas treats, it also brings people from all areas of the business together to get to know each other and have fun. Mental wellbeing is incredibly important throughout the entire year, not just this one day of January. However, today is a great opportunity to check-in with those around you and to remind them that they are fully supported and able to share any problems they may be struggling with. As the saying goes: a problem shared is a problem halved. 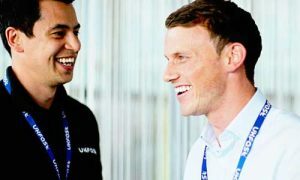 Here’s one of our previous blogs if you want to find out more about mental health at UKFast. Though planning for the year ahead may be making your January a hectic month, it’s super important to know when to cut yourself some slack. Your brain and body both need some time to reflect and rejuvenate after a long month! That’s why, this week, we’re fully supporting the need to reflect in a deep mediation class with our very Zen UKFast yoga teacher, and we’re providing the team with a professional masseuse to massage their aches and pains away on Friday. So, whilst it’s easy to get caught up in the hashtags and resign ourselves to a miserable Monday and week ahead, it really isn’t all doom and gloom. Take a break, take a walk with a friend, check-in with those around you and take some time out to do something you love. Want to be part of our amazing team? If you’re a passionate individual looking for an incredible career we’d love to hear from you!